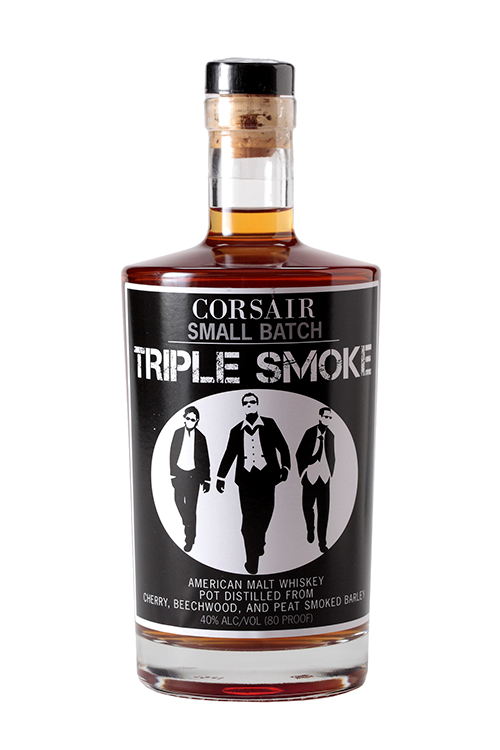 As I noted earlier this week in my post about Corsair Artisan Distillery in Bowling Green, Triple Smoke is the distillery’s most popular product and has won a slew of awards. As the name implies, the whiskey is pot distilled from three fractions of malted barley, each smoked by a different fuel – cherry wood, peat and beechwood – and then aged in new charred oak barrels. Nose: Very rich, with some smoky bacon notes and the cherry on top. Taste: Light and sweet on the front, with a nutty flavor; smoky in the middle, with a little white pepper; fairly short and light finish with the sweetness of the cherry coming through. Verdict: I liked this whiskey much more than I expected to. I’m not a fan of Scotch, so I’m always wary of peat, which tends to overpower my palate. But master distiller Darek Bell has blended the three elements here perfectly, achieving a pretty complex spirit for 80 proof and leaving a light, sweet finish that left this bourbon lover satisfied.